The loss of competitiveness because of elevated energy costs is concentrated in a limited number of sectors. The cost of subsidising energy-intensive companies might be greater than the benefits. Energy competitiveness is in the spotlight. In February 2014, the European Council will discuss the impact of energy costs on the “EU’s competitiveness vis-à-vis its global economic counterparts”. 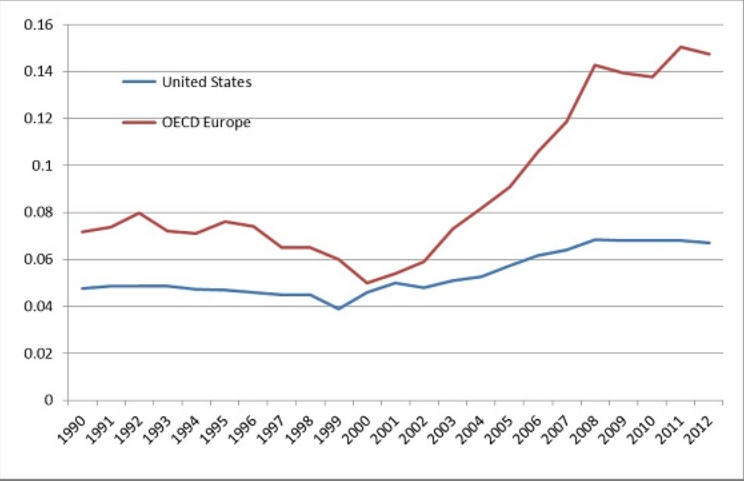 Concern about a loss of competitiveness arises from more than doubling in the last decade of electricity prices for industrial users in Europe, while in the US only a moderate increase was seen. Industrial user electricity prices in $/kWh. According to our study (Chapter 6 in the Bruegel blueprint on Manufacturing Europe’s future), total manufacturing exports are generally not driven by electricity price differentials. But obviously electricity prices have an impact on sectoral competitiveness. In fact, we can identify a number of sectors that are strongly concentrated in countries with low energy prices (such as aluminium, some chemicals). Interestingly, higher energy prices that render some energy-intensive products less competitive on the world market do not necessarily translate into competitiveness losses further down the value chain. 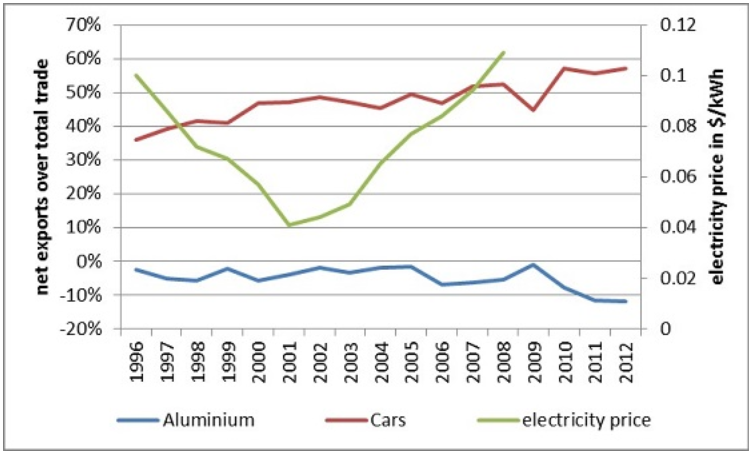 In Germany, for example, the local aluminium industry suffered from a 166 percent hike in electricity prices between 2001 and 2008. This had no visible collateral consequences for car sector competitiveness – car sector exports increased by 142 percent in the same period. Greater reliance on importing aluminium (German aluminium net imports rose by 242 percent) meant that German car manufacturing could remain competitive. Furthermore, we find that countries with elevated energy prices tend to specialise in sectors with higher levels of value added and employment, compared to countries with low energy prices. Therefore, policies designed to protect energy-intensive sectors might have adverse effects when the cost of these measures is borne by other parts of the economy. As energy intensive sectors contribute relatively less to employment and value added, any advantage that they might gain is likely to be insufficient to compensate for the loss of jobs and value added caused by the loss of competitiveness elsewhere in the value chain.